This is a tutorial to walk you through how to use Quartus II and ModelSim software together to create and analyze a simple design (an inverter), then we’ll compare the RTL and Gate-Level simulations with the results on a DE0-Nano. 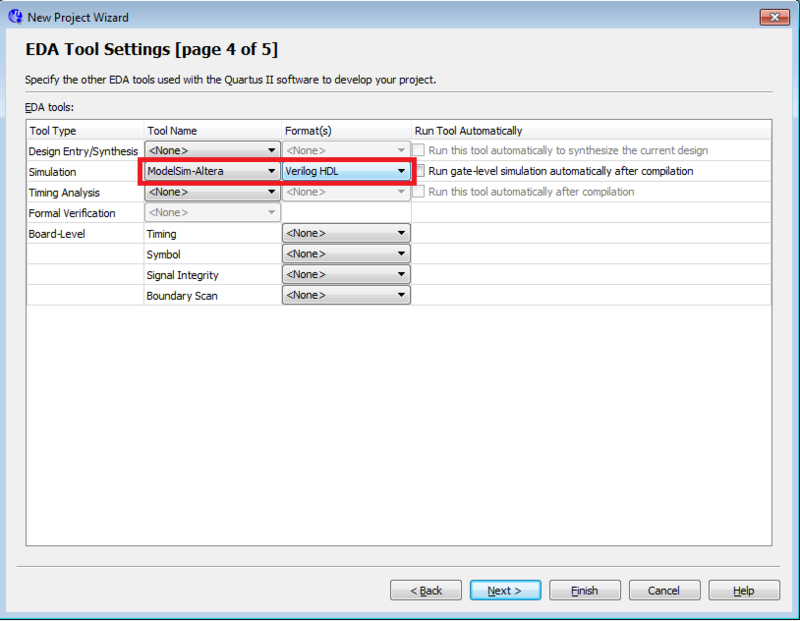 This tutorial assumes you have some basic experience working with Quartus II. Going through the examples in the DE0-Nano User manual should be sufficient. You can see the versions of my software aren’t the same, this is probably why I have the EDA tool pathing issue described below. I recommend installing both tools at the same time, from the same release. 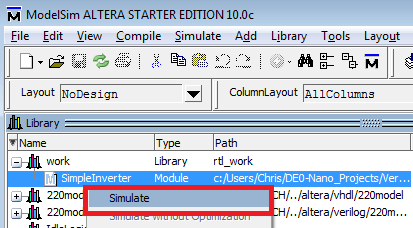 Note that you will have to install the ModelSim (Altera Version) software separately from Quartus, Altera’s website makes it seem like they come bundled but this is not the case. Start by creating a new project in Quartus II. 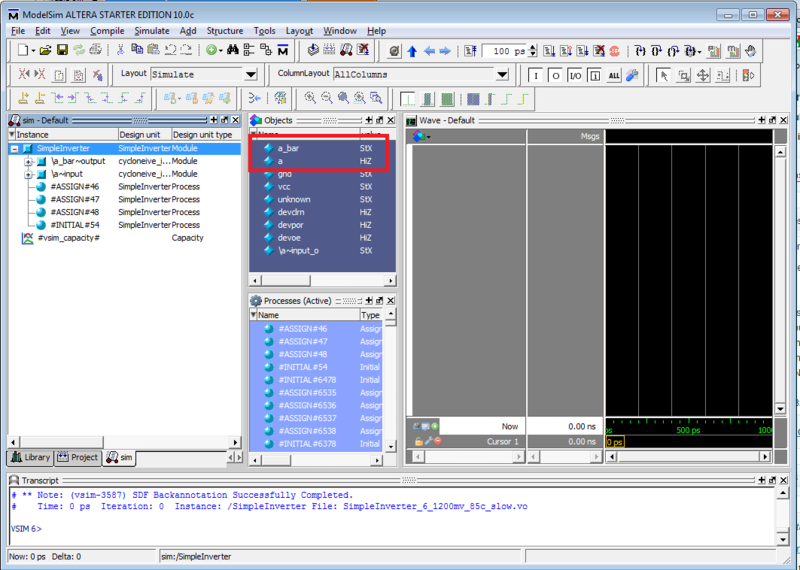 When using the New Project Wizard, make sure to select the DE0-Nano’s FPGA which is the EP4CE22F17C6. 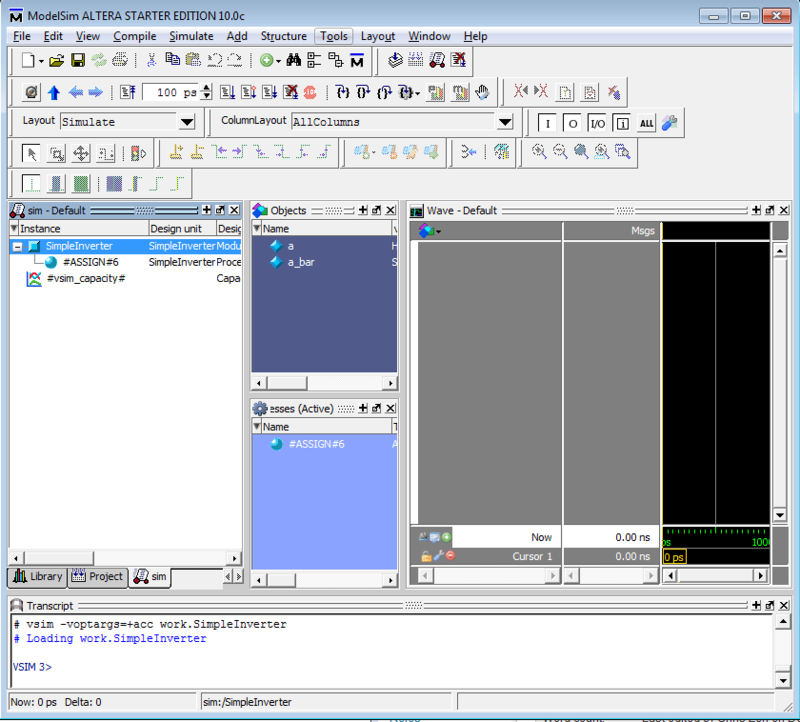 Also, select the ModelSim-Altera as the simulation tool and select the format as Verilog HDL. 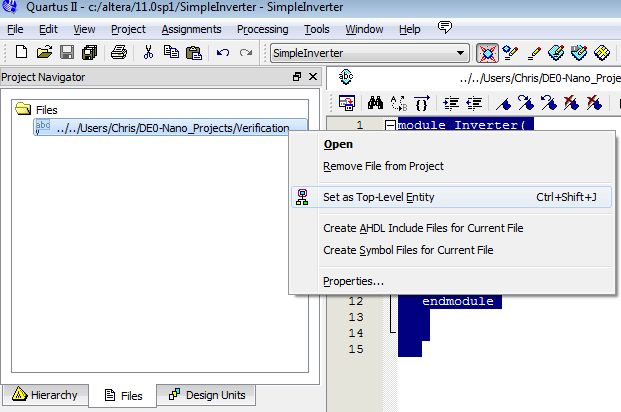 Now create a new Verilog file, which you can save as SimpleInverter.v. Now that the HDL has been created we can start ModelSim (from within Quartus) to do the RTL verification and ensure the design works as we expect. 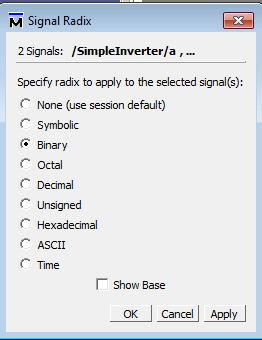 It’s quite confusing the first time you use ModelSim from Quartus because after ModelSim opens it doesn’t give you any tips as to where your Inverter went. By default the Inverter is put into the “work” Library. 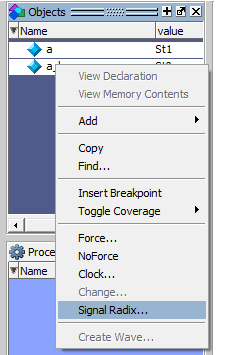 If you don’t see all these windows you can bring them up from the Windows -> Toolbar menu. 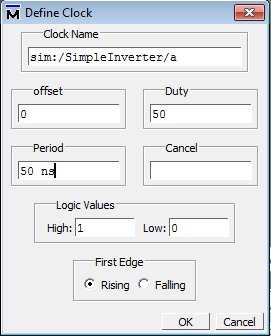 Let’s make it a 20Mhz clock, so a period of 50nS, make sure to keep the lowercase “ns” or ModelSim will complain. 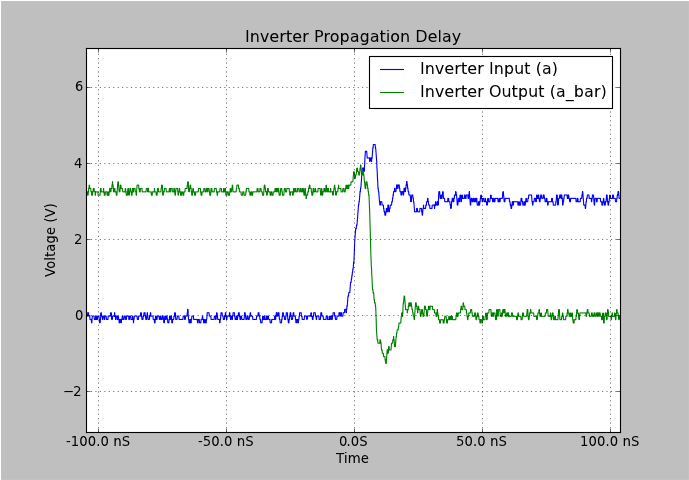 In order to see what a non-ideal inverter might look like, let’s jump back to Quartus. Now that the full compilation has finished, we can run gate level simulation. This will include some of the real-world delays and give us a better expectation of how the design will really work. Next, you’ll be asked which timing model you want to use, let’s just pick the default, “Slow -6 1.2V 85 Model”, this simulates nominal core voltage at 85degC. 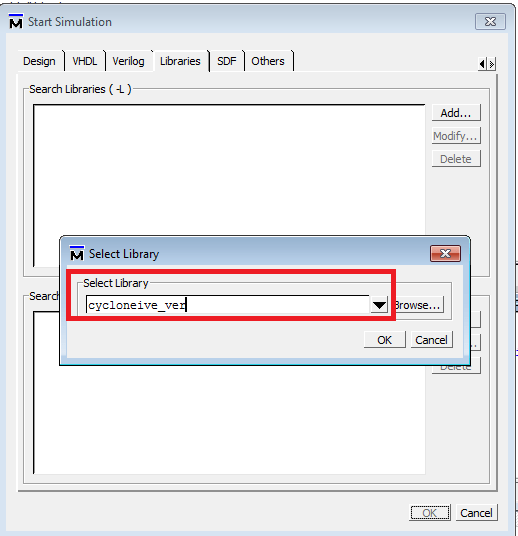 If you get a NativeLink error, something like “error deleting "msim_transcript": permission denied.” you’ll need to make sure you close your current ModelSim environment, or at least stop the current simulation. # ** Error: (vsim-3033) SimpleInverter_6_1200mv_85c_slow.vo(67): Instantiation of 'cycloneive_io_obuf' failed. The design unit was not found. # ** Error: (vsim-3033) SimpleInverter_6_1200mv_85c_slow.vo(77): Instantiation of 'cycloneive_io_ibuf' failed. The design unit was not found. 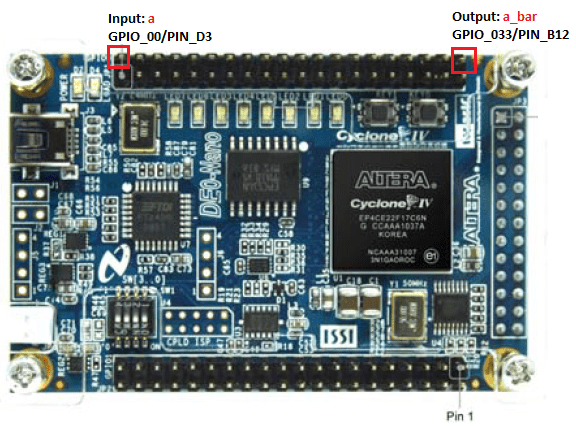 We need to start the simulation and tell it where to find the Cyclone IVe I/O pin library. After you kick off the simulation you’ll be presented with a similar ModelSim simulation as before, however there are now a few extra signals and design units. You can see the signals we care about, a and a_bar are still present. Let’s add those signals to the Wave window, create an input stimulus on the a signal and start a 200nS simulation like we did in the RTL Simulation above. Now we see a very different behavior than we saw in the RTL simulation, there is some propagation delay between a going high and a_bar going low. 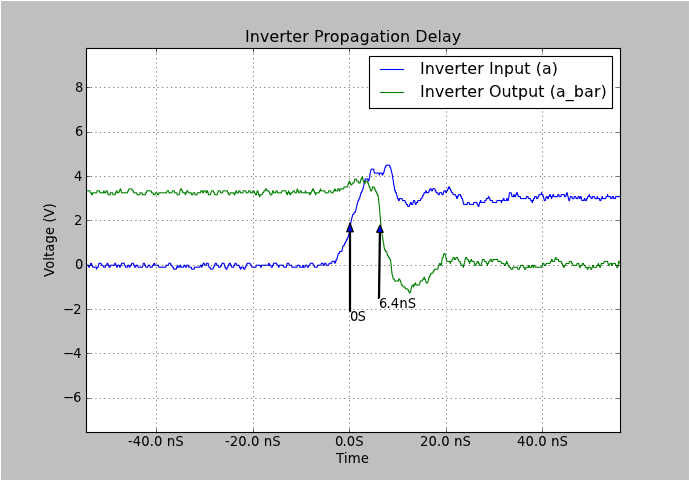 We can see ModelSim and the Altera models are estimating a 6.7nS delay. In this tutorial, we’ve covered the basics of running simulations in ModelSim of designs created in Quartus II. Let me know if this was useful and informative, or if I’ve left anything important out. It’s actually a nice and helpful piece of information. I’m satisfied that you simply shared this useful information with us. Excellent, glad you got it going. Have fun. # ** Error: (vsim-3033) PPA.vo(4985): Instantiation of ‘cycloneii_routing_wire’ failed. The design unit was not found. # ** Error: (vsim-3033) PPA.vo(5006): Instantiation of ‘cycloneii_io’ failed. The design unit was not found. # ** Error: (vsim-3033) PPA.vo(5025): Instantiation of ‘cycloneii_routing_wire’ failed. The design unit was not found. # ** Error: (vsim-3033) PPA.vo(5046): Instantiation of ‘cycloneii_io’ failed. The design unit was not found. # ** Error: (vsim-3033) PPA.vo(5065): Instantiation of ‘cycloneii_routing_wire’ failed. The design unit was not found. # ** Error: (vsim-3033) PPA.vo(5086): Instantiation of ‘cycloneii_io’ failed. The design unit was not found. Thank you for your reply…..
Is there a particular aspect of the flow you are struggling with? I think the two demo/tutorials that come with the DE0-Nano user manual are very good at explaining the basics of creating a new design, compiling and programming. I feel this blog post covers the portion of taking a design from Quartus into ModelSim and doing a basic simulation. Hi, I’m a hobbyist and while my circuit seems to work, it looks nothing like the simulation. In my case I try to talk to the ADC unit. 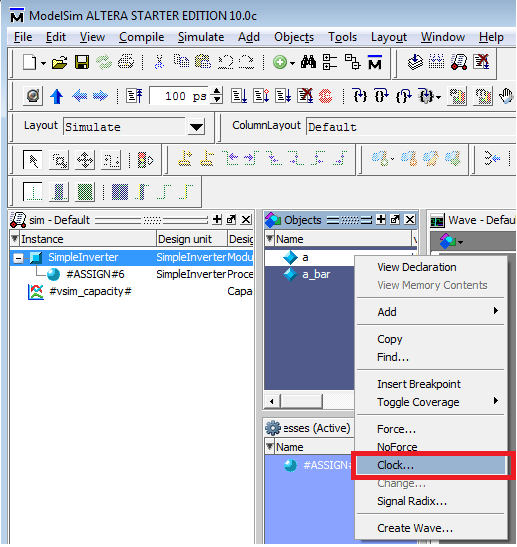 – how to create a random wave vector. e.g. I need a reset pulse, just one of about 3 clockticks, occuring at 2000ns. 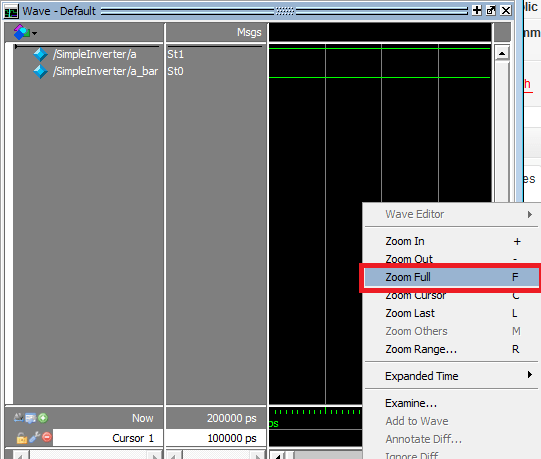 how to enter such a waveform ? – short pointer on how to go about internal registers that remain a red line ? I fear they might be optimized away or something.. Thanks for the kind words, and great suggestions. When I have some more time I’ll put together a post talking about had to add stimulus to the simulations, both from the Quartus side, and in the Modelsim side. Hi sds, thanks for the feedback. 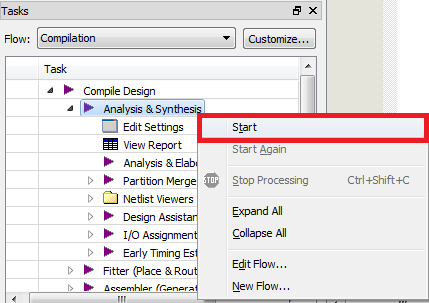 To do the Gate Level Simulation, make sure you first do a “Full Compilation” (See that section above), this should run the EDA Netlist writer for you. 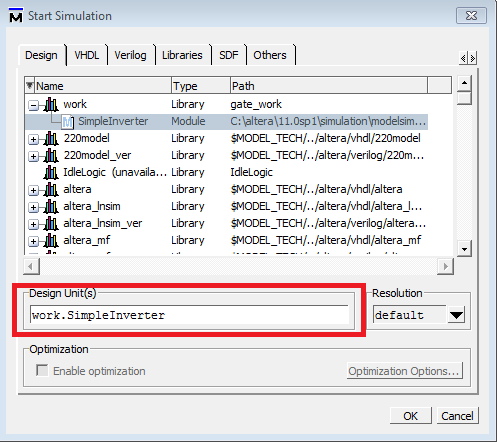 To quote one of the Altera manuals: “To perform gate-level timing simulation, EDA simulators require the cell delay and interconnect delay information of the design”, this is what the EDA Netlist Writer provides. 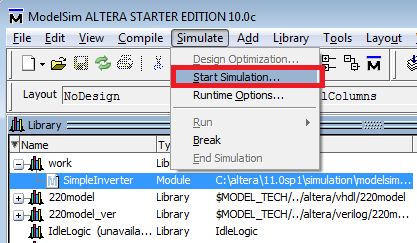 (Make sure your project has ModelSim-Altera setup as the simulation tool before the compile). Hi ! It was so useful , Tnx ! I have a problem in gate level simulation . 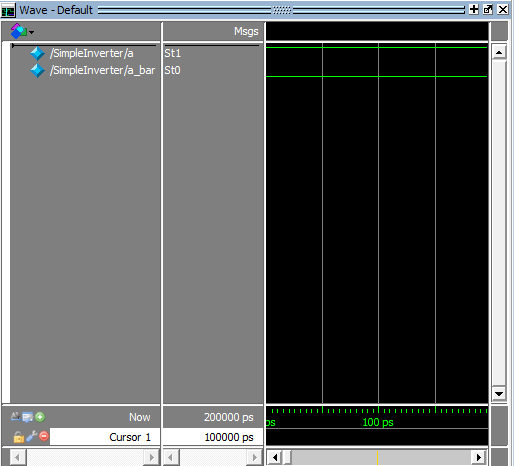 I’m trying to test my adder in gate level simulation, but It said that it cant find the file “test.sft” . 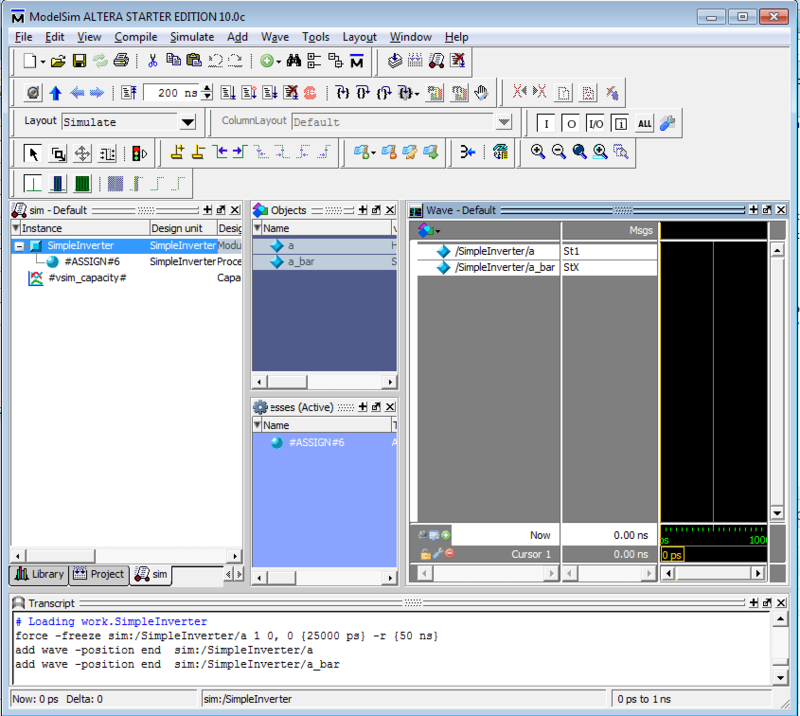 (my project name is test) and said that ” run the EDA Netlist Writer . what is that ? Keep blogging on DE0-Nano, it is very interesting! Great introduction, has saved me hours, many thanks. Just one question, I have a design that uses a Megafunction and Modelsim complains that it can’t find it. Any suggestions as to how you can simulate when Megafunctions are included. Glad to hear it. I wish the software had better ways to auto-upgrade, or to notify you automatically of updates. Ah well, some day I’m sure. I just installed QuartusII 11.1sp1 and Modelsim 10.0c starter edition, and the gate-level simulation works perfectly, thanks for the help. No problem. Let me know if you still run into problems after the upgrade. Hii im facing the problem of getting the delay in gate level simulation. Infact the simulation is same as rtl level simulation without any delay. Hi Chris, you are right, Im using Quartus II 10.1 and ModelSim 6.6c, that must be the problem. I’m going to update de version and see what happen, thanks for the info. Hopefully I can help. What versions of Quartus and ModelSim are you using? It looks like this might be a problem with the Software version 10.1, but is fixed with the 10.1sp1 software. Sounds like an upgrade might get you all fixed up.